Picasso met Jacqueline Roque in 1953 at the pottery when she was 27 years old and he was 72. He romanced her by drawing a dove on her house in chalk and bringing her one rose a day until she agreed to date him six months later. In 1955, when Picasso's first wife Olga Koklova died, he was free to marry. They married in Vallauris on 2 March 1961. 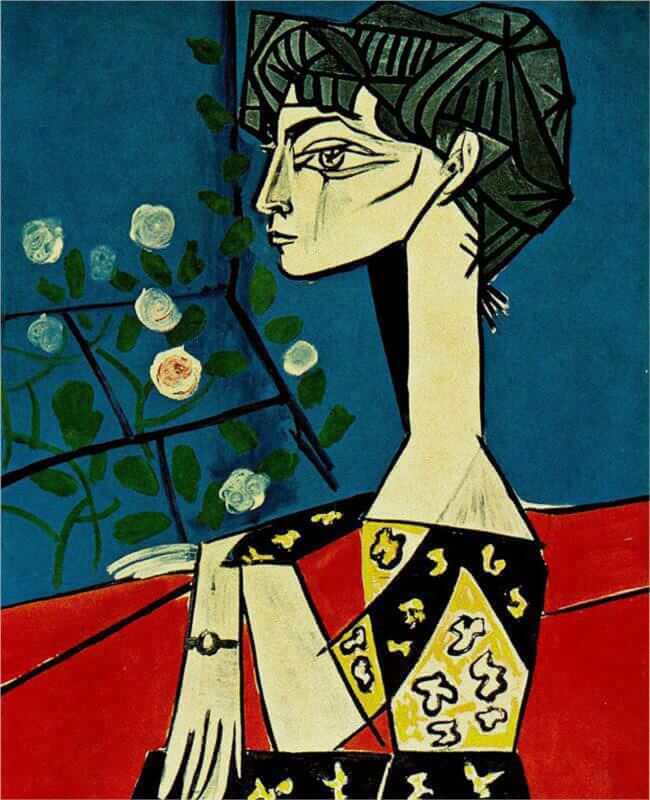 Jacqueline with Flowers, 1954 celebrates the entry of Picasso's new companion, Jacqueline Roque, into his painting. Antonina Vallentin calls the figure a "modern sphinx", and it is true that in this crouching position, with her long neck and almond-shaped eyes, Jacqueline has something of the mythic figure about her. She liked this particular position for sitting, and it will be seen again in later portraits, including the "Odalisques" series. When Picasso first met her, he was struck by her resemblance to the woman with the hookah in Delacroix's Women of Algiers. He saw in her the same classical, Mediterranean type of beauty that he had begun to paint in Gosol. Roque's image began to appear in Picasso's paintings in May 1954. These portraits are characterized by an exaggerated neck and feline face, distortions of Roque's features. Eventually her dark eyes and eyebrows, high cheekbones, and classical profile would become familiar symbols in his late paintings. It is likely that Picasso's series of paintings derived from Eugène Delacroix's The Women of Algiers was inspired by Roque's beauty; the artist commented that "Eugene Delacroix had already met Jacqueline." In 1955 he drew Jacqueline as Lola de Valence, a reference to a famous painting of the Spanish dancer by Edouard Manet.